Today I decided that we were going to hand wash the dishes after lunch. I was washing and rinsing and Paige was drying and putting away. I said "isn't this fun?" and she said "yea, it's like we are Ma and Laura Ingalls!" Now, some may laugh at that and think "gee, thanks", but to me it was a compliment and one I will remember for a long time. How precious and sweet a time that I got to spend with my sweet little girl. I don't have to worry about the little boys getting to them. We are in the midst of intense training, but I don't feel the need to test the waters on everything just yet. My oldest children are very different - one loves art, drawing, etc. She would enjoy putting more into her picture of the event, than the details of the even itself. The other one loves history and he would enjoy writing more about the people and facts about the event. I figure the book of centuries gives us the flexibility that we need. It stores up nice and easily!! So with their help, I put these together today. I'm taking a little break to organize all of my digi scrapping supplies. I should have done this as soon as I started, but I didn't - so I'm paying for it now. I download tons of freebies that I really like. if I don't really like it, I don't download it - free or not. JUst the same as I wouldn't buy paper supplies I didn't like. And often if I got freebies I didn't like - I would pass them off or throw them away. I'm using the ideas from Roxanne Paxman at www.scrapgirls.com She explains these in the 15 things digital scrapbookers should know free ebook available on the website. I'm going to be pairing this with picasa2 for a great way to search for just what I am looking for. She is supposed to be coming out with a picasa tutorial soon. My mom and dad came over this weekend (and my sister on friday night) and we scrapped. 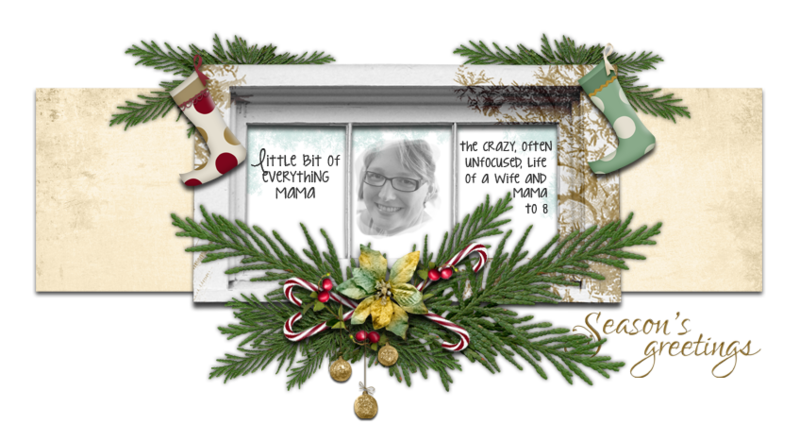 I helped her layout about 18 pages for her Christmas album. She ended up doing 8 of them on Saturday afternoon! Woohoo!!! I just worked on organizing when she was doing layouts. :( Oh well, I know the time spent on it will pay off. Well, I'll be off the computer until this evening. I'm training little boys today! We are going to do church training after lunch today. Brason will be going into church with us at the end of August, so this is something we really need to do. We will work on it daily while Daddy (Big P) teaches us from the word. We might even download some of the pastors sermons to listen to as well. We have missed a few this summer. We start school on Monday, so I'll be organizing that this week as well. I'm so excited to get started on our new curriculum!! Won't be around much and just wanted to say "hey" to anyone that reads my blog. After the kidlets got in bed tonight, I went digi scrappin' crazy. I was on a role bigtime, but realizing the time, need to get to bed. I've been doing some speed digi scrappin. This was my preferred method when I was a paper scrapper, so I decided to try to carry it over to digital. Basically I just draw a bunch of my pics into PSE. Then I start picking templates and just start squeezing my photos in there, based on chronological order and theme. If I have 5 pics of a certain thing, then I just go in my templates file and find a template with 5 photo slots. I can adjust the templates as need be, though. This will be even faster once I get my templates organized by photo number. Thinking about doing 1, 2, 3, 4, 5, and multiple. Here's a layout that I quickly put together tonight. The journaling at the bottom says: Christian is keeping his eye on the prize - The Ozark Wildcat - May 23, 2008. I used the template by Shutterbug Jenny (free!). Paper is from Vicki at A Work in Progress (free!). Photo is from ME of my biggest boy!!!! Did a little changing of the paper hues to match the photo better. Isn't digital great? I couldn't have done that with paper!! Here's the tutorial I used from TaylorMade Designs. It's free!! And here's the wordart I used from Elegant Wordart (also free!! ), another homeschooler! She was also generous enough to reveal the font she used, which I downloaded for free. The paper was free from A Work In Progress. I perfected the color in the paper as it was lacking some blue hues from his feet. Did that in Enhance; Adjust Color; Color Variations in PSE6. Got the flashcards done and they are going to be waiting for me at costco tomorrow along with 6 new layouts for my Missouri album. So, I decided to enter a contest for a $25 Starbucks Gift Card. Teri at Teri's Thing-O-My-Jigs is a fellow scrapbooker and believer!! She designed a template to insert into one of those Starbucks picture tumblers. So, I got a little crazy and creative and came up with this. I used Dirty Grungy Rock Star Freebie from ScripityScrap.blogspot.com. Check out what I did today. I'll be making a set of these for my boys. I did this after grabbing the templates from another digi scrapper/fellow homeschooler. what a genius idea, huh?! Check out Scrapping with Liz here. I'll put them in the little 4x6 booklets and letting them use them as write on wipe off sheets as suggested by Liz. Not on purpose! Our dog, Titan, has decided that it's time to clean out the barn. Big P paid C.12.B. and his friend A a couple of months ago to move a TON of junk into our trailer to haul to the dump. This was stuff that had gotten water damaged and was no longer usable. The left over stuff that needed to be gone through was left in the barn. Apparently our dog has decided it's high time that we cleaned it out, so he started hauling stuff out into the yard and "going through it" (read this: tearing it up!). So, every couple of days, C.12.B. has to get out there and bring stuff in. Last night, when Big P got home from work, he brought in a ton of memorabilia. These were pictures that were from high school and before. I had never realized how many movies I went to as a teenager. I kept all the tickets and wrote on them who I went with. I decided that I needed to salvage some of these photos that had been water damaged to keep as much integrity in them as possible. Here are a couple that I scanned in. I thought I would throw my latest digi layout up here and show you what I have been up to. I'm making great headway on our Missouri album. Big P and I picked out an album for the trip while we were on our mini-weekend. It was fun having him help me decide on one. We picked a pretty black toile. Here's the newest layout. I made this using the quick click template "magic" from DigitalScrapbookPlace.com. The paper and elements are a freebie from www.theshabbyprincess.com - Festival. Big P and I had our wonderful mini-weekend and returned home tonight. The reason that I say it was our mini-weekend is because my gracious in-laws watched our 4 oldest children from Friday at 1 until we picked them up Saturday evening. We stayed at a local hotel for the night that was close to their home. We just did normal stuff. Costco was on our list of things to do to exchange an item, so we did that together and had a wonderful time just browsing, without anyone really needing our attention. A.2m.B. was with us, of course, but he just enjoyed being in the slingezee the whole time. We ate yummy food and Big P bought me some new outfits, but most of all we just enjoyed talking uninterrupted. Our main discussion was on our upcoming Planning weekend, which I will have to post about later. Last week big P even brought me roses!!!! Pics of that will be in my July roundup and photo a day post. It's good to be home, but most of all we are just glad to have our babies back. It's funny how you really want a little break, but you can miss them sooooo much. C.12.B. had been away from us all week, while helping at a day camp at Dallas Heritage Village. He stayed with my in-laws and they took him back and forth. You all know how much I love audios. I was introduced to seminars on my iPod via Cindy Rushton. That was about 3 years ago. I was just sharing with a friend the other day about an audio I was recently listening to, from The Ultimate Home School Expo. I told her about Christie Berry and she said "I recognize that name, I wonder if it was through Cindy Rushton." Sure enough, she had also bought a ticket to the Ultimate Home School Expo and was listening to all the audios. Cindy is great. She is fun to listen to, always has an encouraging word, and is challenging as well. I never leave without something to chew on. She picks the greatest guest speakers, too. She has a seminar this weekend for getting organized for your school year. Here's a link to the website, but I'm going to post the information in here as well. The fun starts tomorrow with preview chats. Let's Get Organized for the New School Year! When you are ready to enter, you will enter your NAME or EMAIL ADDRESS in the first blank. Password: letschat (password is case sensitive-do not enter any extra characters or spaces-password is only in effect during the actual chat) Remember...your password is different for chats and other classes. It only works for the room when the room is open for the study. Let's Get Organized for the New School Year Virtual Seminar! Membership Site AND free ebooks/audios! I made this digital layout today using a freebie called Blissful Morning I picked up at Raspberry Road Designs. This is a great site with TONS of freebies and beautiful, inexpensive kits. I've done about 8 scrapbook pages so far and I had some printed. I was impressed with the finished versions after printing at Costco. Great price - best I have found yet. I'm in the process of backing up my entire computer. I wouldn't have been this "willing" to give up my computer for a couple of days, but DH is a generous man and bought me a new one! He had "ulterior" motives, sort of. He needs a personal computer as he can't do much on his work one. But mostly he wanted to get me one because I run a lot of stuff on my computer and use it for everything, as previously mentioned in another post. I needed a dual core for it to run properly. But, I digress. So, I ran across this article (most of my family is out picking up our raw milk, hence the time to sit here and read) and it really set me on fire to get this done. I literally have THOUSAND of photos on my computer and hard drives. We actually have two external hard drives - the regular 250 g will be mine for scrapbooking. The other is a mac time capsule that we use to network all of our computers together with the printer. Check out the article. I hope it fires you up! What books and/or magazines did I read this month? I'm very proud, as I read The Old Schoolhouse magazine front to back (okay, so it was the Spring edition). I also started reading Homeschooling at the Speed of Life, Love Comes Softly, and almost finished The Busy Mom's Guide to Simple Living. What movies and/or tv shows did I watch this month? The Girl of the Limberlost was a surprisingly good movie. We are enjoying the list that Nancy Campbell sent out. I will post that soon. I did a couple of revisions, and took off movies that were on our "no no" list. This list is compiled by Nancy, but were recommendations from many many women. Each family has their own standards, so that needs to be remembered. Most of the movies were available from Netflix. What special days did I celebrate and how? We had a nice Father's Day with Big P. We visited the nursing home and sang together with them, before and after Big P gave a message. Big P's birthday was on the 29th, but we didn't get to spend much of it together. :( They were on their way home from Rockport most of the time. My children are always making me things, so I know I pinned up a couple of pictures. I was able to give some thank you gifts to Tanya and her mom for coordinating the scrapbook weekend for us. They were little tin mailboxes covered with scrapbook paper and stickers with their initials on them. I thought they turned out adorable, and both of them were surprised and thankful. It was nice to give something unexpected. What illnesses or health concerns did I have? Thank you Jesus for continued good health! What fun things did I do with my friends and/or family? I took the bigger 3 children to the IMAX theatre to see Dolphins and Whales in 3D. That was very exciting. We also had VBS at church, which was lots of fun for everyone. I got some chatty time with other mamas. For our pre-Father's Day celebration, we went to the lake for a few hours, had a picnic and played in the water! And of course, the scrapbook weekend was a blast. What new foods, recipes or restaurants did I try this month? We tried the Saving Dinner freebie frugal menu. I've enjoyed all the recipes and they were easy to make. On Father's Day we had a nice lunch at Applebee's. We've been there before, but a dinner out is always a treat. I purchased our George Foreman standing indoor grill. It can also go on the counter. We've used it a few times and really like it. It's a bit harder to clean, just because of the size (it's HUGE), but we are pleased! I also "splurged" and bought myself a new blog design. What were this month's disappointments? Feeling a bit "ahead" and then plummeting into feeling "behind" in the day to day tasks that need to be taken care of. What were my accomplishments this month? We did establish what seems to be a great routine for cleaning the house. It is just a matter of some sticktoitiveness! Anything else noteworthy to record? I discovered digital scrapbooking through some friends at the scrapbook weekend. I'm hooked and have already made 6 pages for our Missouri trip. It's very portable and I can stop and start as needed. Love it! Also, I had previously planned to have a planning weekend by myself in the Rv getting some necessary things done to start our new school year in August. Instead, after hearing some incredible messages on the Ultimate Home School Expo, and listening to one about Purposeful Planning, I asked Big P about us doing a planning weekend as a family to get our family goals and plans in order. So I'm about to make reservations for us to go to the campground where I went last year (just up the road) and we will hang together. This is the park where we were going to be staying when we were planning to do the debt free in the RV thing. In my search for scrapbook info, I found this great website. One of the posts was really inspiring to me. It was especially fitting, because I watched Tanya scrapbook her pictures in chronological order the other day. It was great the way that she whipped through them. I thought this was perfect, because it would give an overall picture that you could start your that month's section of your scrapbook off with. I created this with the help of the Scrapbook Software Secrets Revealed Course for Photoshop Elements 6.0. These little videos are incredibly helpful and make this seem sooo easy. These aren't necessarily the colors that I would have picked, but they came with the course and I wanted to follow along, thus, I used them. I don't think it's necessarily the colors, I just really don't care for that green funky looking boarder behind the photo. This wasn't hard, a bit time consuming at first, but not hard. Learning takes time, but I really get the gist of it and think that I could easily pump out some layouts for our Missouri trip - my next project.